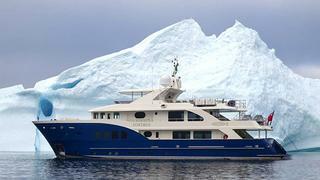 A call to bluewater in Antibes brings news that they've found a buyer for the 34.14m expedition yacht Fortrus, listed by Andrew LeBuhn at Camper & Nicholsons. Built by Inace in 2008 to ABS class, Fortrus is MCA compliant. Her Brazilian cherrywood interior accommodates 14 guests in a main-deck suite, VIP stateroom, three double and two twin cabins. Twin 715hp Caterpillar engines give her a range of 3,800 nautical miles. Fortrus was asking $9.75 million.